“Forest User Groups Recognized for Meeting Highest International Standards of Sustainability” read the headlines in the Kathmandu newspapers in January 2005. Malika Handmade Paper, under the umbrella of Federation of Community Forest Users (FECOFUN), was awarded the renowned Forest Stewardship Council (FSC) certification. FSC, which has certified over 100 million hectares of forests in 60 countries, promotes responsible forest management by evaluating and accrediting certifiers, encouraging the development of national and regional forest management standards, providing public education about independent, third party standards, and ensuring the world’s forests are protected for future generations. The FSC certification will enable the members of FECOFUN, including Malika Handmade Paper, to further attract and enter into stable, long-term contracts with buyers of non-timber forest products. This certification, one of only five for non-timber forest products in the world, and the first in Asia, is momentous and should serve as a model for the rest of the world. 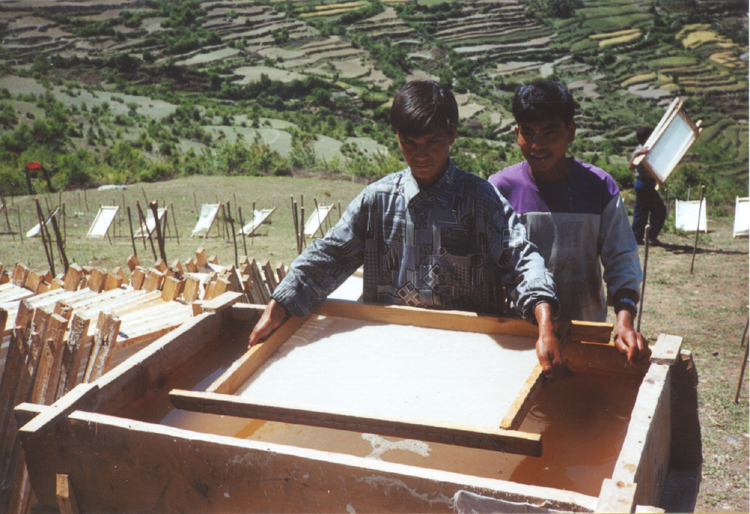 The FSC certification is monumental for Malika Handmade Paper, and for the mountainous village of Kailash in Western Nepal. For generations, the residents of Kailash had difficulty earning a living, and men were often forced to travel to India for jobs in order to support their families. The solution- income-generating activities that conserve the region’s precious forest resources- seemed just out of reach. Then, in 2000, with guidance from EWV/ANSAB, community members launched a small company called Malika Handmade Paper, with the goal of creating the beautiful papers for which Nepal is known, without depleting the region’s forest resources. Previously, Daphne, the shrub used to make the paper, had been harvested by locals and sold in raw form, with little community or government oversight in regard to conservation. As a result, the resource was rapidly diminishing. Malika Handmade Paper sought to change all this through community involvement and awareness. By 2003, the Malika enterprise was growing and had leased 912 hectares of land from the Nepalese government, which they managed sustainably. They chose to process the raw Daphne into finished paper, keeping more of the value of the resource in the community. Additionally, with the ongoing development of Malika Handmade Paper, greater employment opportunities were created not only for the men of Kailash, but also for the women, addressing EWV/ANSAB’s goal of enabling community members to maintain their livelihoods through successful enterprise development. EWV and ANSAB’s Enterprise-Based Biodiversity Conservation Program that helped establish Malika Handmade Paper is part of the United States Agency for International Development’s Global Conservation Program. The goal of the program is to conserve globally significant mountain biodiversity of Western Nepal through community forest management linked to enterprise development. Malika is just one of dozens of district level enterprises that have been assisted by the program, generating over US $1 million annually in income for the rural communities. While the Malika business had developed into a successful enterprise over the years, it lacked the credibility that is acquired with FSC certification. Now, with FSC certification, Malika Handmade Paper, and the other enterprises awarded, will gain access to the most reputable buyers who reward sustainable forest management. Through the success and recognition of projects such as Malika Handmade Paper and others, EWV/ANSAB is making the case that the community-based, business-based method is the best approach to sustainable development and community prosperity.